Wear these beautiful turquoise rings alone or combine them to create a statement, draw attention and attract compliments. 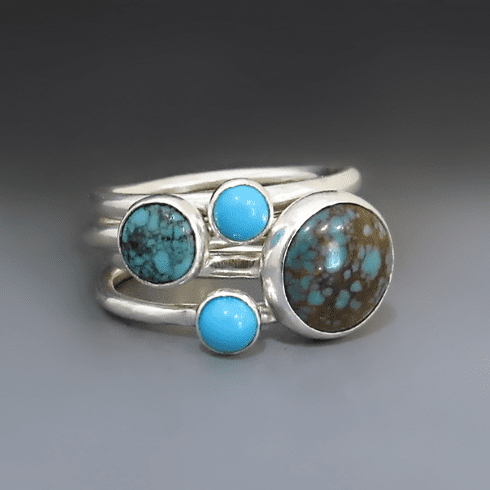 These are genuine turquoise stones so each stone varies slightly in color and veining making your ring a one of a kind. Each ring is hand cut, set and polished from scratch. The stones are hand sent, then the rings are tumble polished. The bands are slightly hammered to give these rings a lovely organic feel to them. The 4mm sky blue stone is Sleeping Beauty turquoise. The Sleeping Beauty mine, located in Arizona, closed in 2012, making the material valuable and increasingly rare. The 6mm and 10mm stones are Chinese turquoise. The color varies from stone to stone and ranges from blue-green to green. These stones display quite a bit of matrix, which gives each stone a unique patterning. All rings are set in sterling silver. The ring band is 2 mm wide. Slight variations in color may occur from stone to stone.